After Hurricane Irma made landfall, devastating thousands of homes in Florida and the East Coast, NALC volunteers offered to help. Shepherd of the Woods Lutheran Church in Jacksonville, Fla., offered to house volunteers, and provide access to facilities with showers. However, housing and showers became an issue in the southern part of Florida. 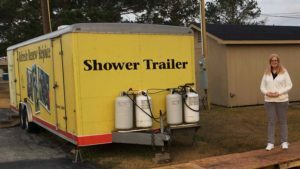 Pastors Bill and Rebecca Heber of Oasis Church in Lake Mary, Fla., shared that there might be an opportunity to get a shower trailer from Rebecca’s brother’s church in Wisconsin. 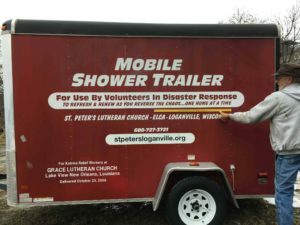 Pastor Chris Miller, Rebecca’s brother, was the pastor of St. Peter’s Lutheran Church (ELCA) in Loganville, Wis., when he and a church member had the idea to build a shower trailer in 2005 after seeing a similar trailer while doing disaster relief work in Biloxi, Miss. They and a crew of 23 from their congregation were helping with Hurricane Katrina relief efforts. The trailer had extended service in New Orleans during Hurricane Katrina relief efforts and at five other disaster sites. Mary Bates, NALC Disaster Response Coordinator, reached out to St. Peter’s Lutheran Church in Loganville, Wis., and found the congregation to be very concerned about the impacted families in Florida and willing to donate their two-stall shower trailer to NALC Disaster Response. NALC Disaster Response now has a shower trailer in Texas for Hurricane Harvey recovery which is currently parked at the South Texas Mission District warehouse at Peace Lutheran Church in Rosenberg, Texas, and a shower trailer for use on the East Coast. God has blessed NALC Disaster Response with amazing volunteer teams and tremendous support to build our capacity to serve wherever and whenever disasters strike.